Pirates - Ready Steady Gone! Everyone knows that unauthorised downloading or copying of mp3s and other forms of digital music is illegal. 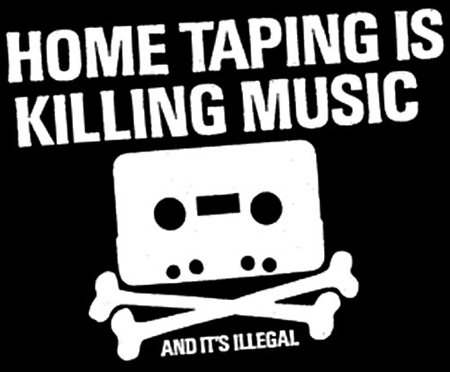 Music piracy is nothing new, though – it actually predates the digital age by at least forty years. Relatively inexpensive tape cassette players became readily available in the mid-seventies and that’s when the long golden era of the mix-tape began. From the mid-seventies through to the eighties and early nineties, everyone was at it; either recording music from radio stations or copying borrowed LPs and prerecorded cassettes onto their own cassette tapes. Radio/cassette players became standard equipment in new cars, ensuring that the copying of tapes continued through to the CD age. The practice was so widespread that the record industry predicted a decline in recorded music and the death of record labels. Three decades later nothing much has changed. The music industry is still with us; the major artists and publishing companies are still making mega bucks from music fans; the illegal copying of music is still rife and what’s more is passively encouraged by the likes of Youtube. And the industry is still wetting its pants about music piracy. Even further back than cassette tapes, my dad must have belonged to one of the earliest bands of pirates. In the late fifties reel-to-reel tape recorders were in existence but they were expensive and not that common. My dad was a bit of a technophile and he’d bought one when they first came onto the market. I remember it was a great big heavy thing called a Truvox. Several years later in the mid-sixties Grundig and Phillips brought out smaller, lighter reel-to-reel machines and they became quite popular in homes. But in the early sixties not many people had tape recorders. 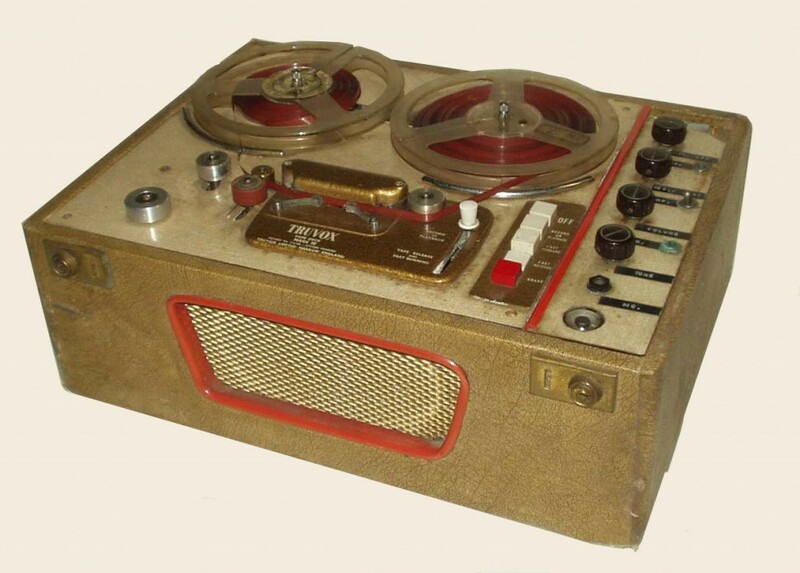 In fact, I didn’t know anyone else who owned a reel-to-reel tape machine around 1960. In 1960 when I was on the cusp of my teenage years I listened to the only radio station that regularly transmitted pop music – Radio Luxembourg. Every Sunday night between 11.00pm and midnight, Radio Luxembourg broadcast the UK’s Top Twenty in its entirety. In July 1960 I persuaded my dad to stay up and record the Top Twenty for me using his Truvox tape recorder linked up to our radiogram. With my help, dad became Pirate Captain George Smith. There’s only two songs of those twelve that have had lasting appeal for me – one is ‘Three Steps To Heaven’ by Eddie Cochrane. The other is ‘Shakin’ All Over’ by Johnny Kidd and The Pirates. As soon as I heard that song it actually did send “quivers down my backbone”. Johnny Kidd’s voice had so much feeling and the guitar riff was something else – back then I’d never heard a guitar played like that before. Eat your heart out Hank ‘tremolo’ Marvin and Duane ‘twang merchant’ Eddy. I was in awe of those musicians called ‘The Pirates’. I wanted to play spine tingling riffs like their guitarist. I eagerly awaited another Top Twenty hit by Johnny Kidd and The Pirates but nothing came. Six years later I became a member of a fairly successful northeast band called the Jazzboard. In the intervening years I’d abandoned the idea of becoming Johnny Kidd’s next guitarist and instead had taken up playing the saxophone. In the autumn of 1966 I found myself playing regularly with the Jazzboard in a northeast chain of nightclubs owned by the Bailey group. The deal was that the band delivered an hour and a half of beat music for dancers, which was in addition to the entertainment provided by the cabaret acts. The three nightclubs we played at were the Dolce Vita in Newcastle, the Latino at South Shields and the Marimba in Middlesbrough. We often used to support the same cabaret acts at each of the three clubs so we were at least on speaking terms with a lot of them. Some of the acts we supported were Gerry and the Pacemakers, Peter and Gordon, The Honeycombes, The Four Pennies, Pearl Carr & Teddy Johnson, Johnny Dankworth & Cleo Laine, Los Bravos plus many others. Probably the most famous and most notorious of the cabaret acts we played alongside was the American rock ‘n roll artist, Jerry Lee Lewis. He was famous because of his fifties international hit ‘Whole Lotta Shakin’ Going On’, his flamboyant personality and his lively stage act. He was notorious for marrying his thirteen year-old cousin in the late fifties. 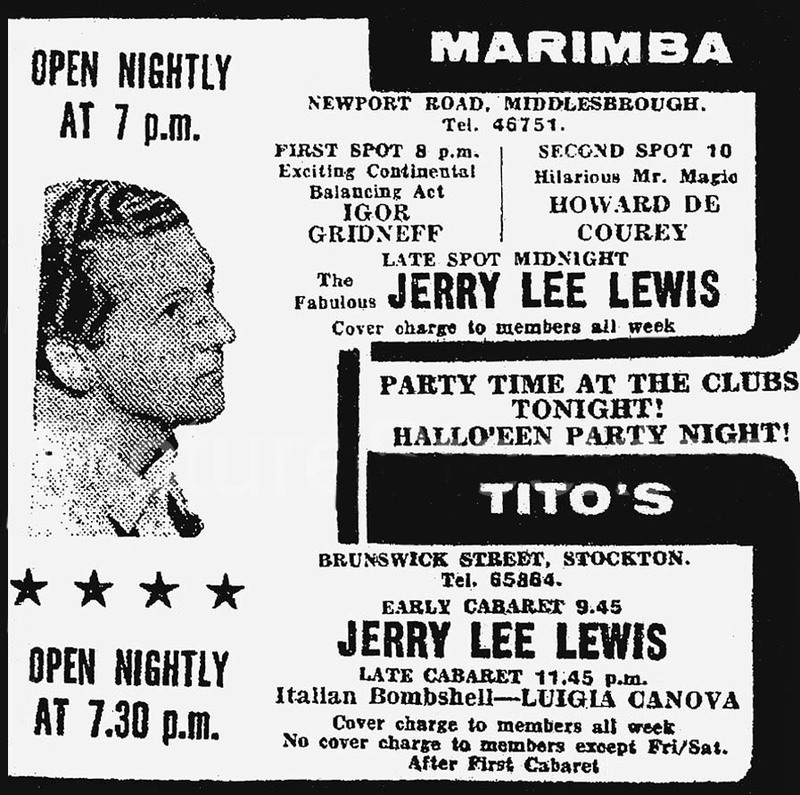 We got to appear with Jerry Lee Lewis at the Dolce Vita, Newcastle on 24th October 1966 then a few weeks later at the Marimba in Middlesbrough. The Newcastle gig was wild. 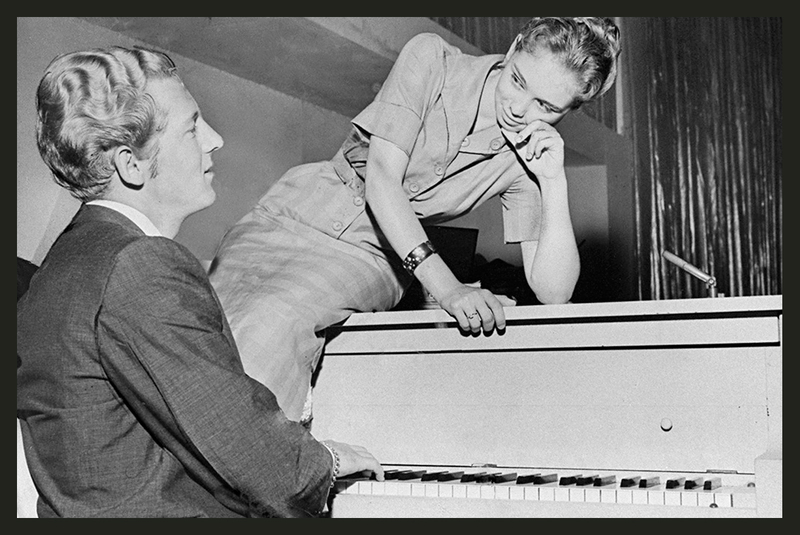 Jerry Lee performed his rock ‘n roll act standing up, hammering away at the piano, sometimes with his feet. I remember his patter between songs; “Man – it’s good to be playing at your great English clubs. Just got in from a club in Birmingham – (long pause) – Alabama!”. Then after the next song it was “Oxford (long pause) – Mississippi!” and so on. There were lots of north east musicians in the audience at the Dolce Vita including a drunken Eric Burdon who alternately cheered and heckled through Jerry Lee Lewis’s set. Anyway, the really big thing for me was that Jerry Lee Lewis was accompanied by his own Memphis backing band plus an English band called The Pirates. 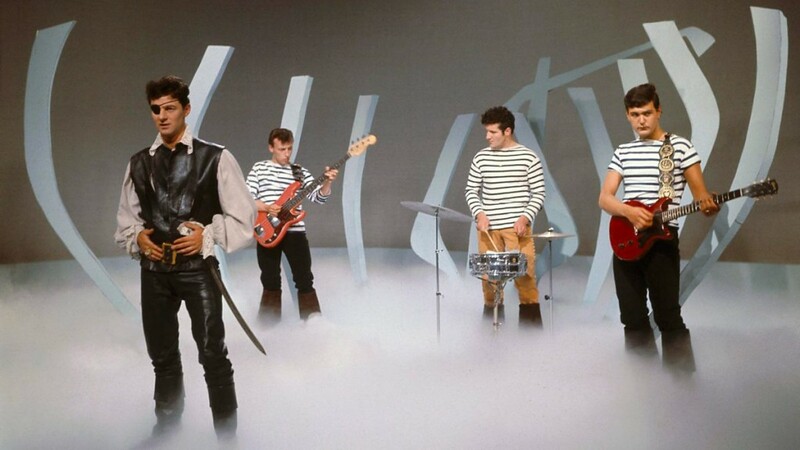 Yes – THE PIRATES – my idols from six years earlier! I was awe struck. They weren’t the original Pirates who recorded ‘Shakin’ All Over’ but they had been backing Johnny Kidd until a few weeks earlier. Jerry Lee Lewis actually used his own American backing musicians but due to a Musicians’ Union ruling he had to have an equivalent number of English musicians on hand. In practice he used his own drummer and bassist most of the time and, as I recall, only one or two of The Pirates actually got to perform with him. So a couple of The Pirates didn’t get to play at all – the bass player and the drummer as far as I remember. Those club nights were particularly long. We were at the venue by 8.00pm and didn’t used to get away until about 2.00am the next morning. It was during those long nights that I got to know a couple of the Pirates. 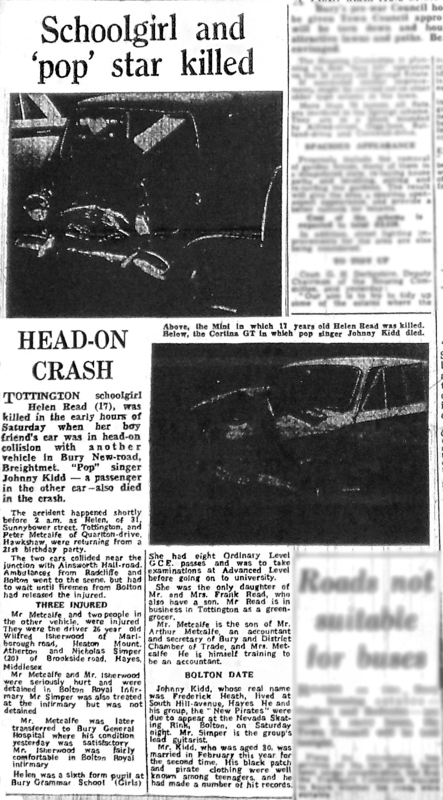 Amongst other things, I found out that Johnny Kidd had died in a car accident a few weeks earlier. It was a great experience for me, spending some time with The Pirates. They told me that apart from being very well paid for doing next to nothing, everything they spent while on Jerry Lee Lewis’s UK tour went on his bill. I had a meal with the guys at the Marimba’s restaurant and even that went on Jerry Lee’s tab. Yes – one of the best known rock n’ roll singers in history stood me a meal! It’s only fairly recently I learned a little bit more about the tragic death of Johnny Kidd. He died on 7th October 1966 just seventeen days before the Jerry Lee Lewis gig at the Dolce Vita. Another member of the Pirates , Nick Simper, was injured in the accident. He wasn’t part of the Jerry Lee Lewis entourage. Johnny Kidd was a fabulous vocalist and his death at the age of thirty was a great loss. For me, his memory will linger on through his 1960 hit – “Shakin’ All Over”. Also those nights with The Pirates at the Jerry Lee Lewis gigs. Albeit 'Apache' has always lingered on for me - completEly haunting.